Graeme Murphy was born in Melbourne and studied at The Australian Ballet School. He has danced with The Australian Ballet, Sadler’s Wells Ballet (London) and Ballets Félix Blaska (France). In 1971, he received an Australia Council Grant to study overseas. He returned to Australia in 1975 as a freelance choreographer. 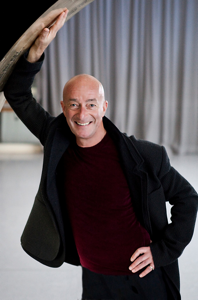 The following year, he was appointed artistic director of Sydney Dance Company (then known as The Dance Company NSW), a position he held until 2007. During his 31-year tenure, he created more than 50 works, including 30 full-length productions. Graeme is the recipient of an AM (1982) for his Services to Dance and three honorary doctorates – Hon. D. Lit. Tas (1990), Hon. D. Phil. Qld (1992) and Hon. D. Lit. UNSW (1999). He was honoured at the Inaugural Sydney Opera House Honours (1993) and named a National Living Treasure (1999) by the National Trust of Australia. He has received a Helpmann Award for Best Choreography, Body of Work – a Retrospective (2001); the prestigious James Cassius Award (2002); the Green Room Award for Concept and Realisation, Swan Lake (2003); a Centenary Medal (2003); named Cultural Leader of the Year by the Australian Business Arts Foundation, receiving the Dame Elisabeth Murdoch Award (2004) and was listed among Australia’s 50 Most Glamorous Exports at a special celebration hosted by the Australian Government and Austrade (2005). He received the Award for Contribution to Cultural Exchange by the Ministry of Culture, the People’s Republic of China (2008) and the Fred & Adele Astaire Award for Excellence in Choreography in Film for Mao’s Last Dancer (New York, 2011) and was made Officer of the Order of Australia (AO) from the Queen’s Birthday Honours (2012). Graeme’s directing and choreographic credits include Turandot (Opera de Montréal in 2014), Metamorphosis, Turandot, Salome, The Trojans, Aida, and The Merry Widow in 2017-18 (Opera Australia); Ainadamar (The Adelaide Festival of Arts); Beyond Twelve, Nutcracker: The Story of Clara, Swan Lake, Firebird, The Silver Rose, Romeo & Juliet and The Narrative of Nothing (The Australian Ballet); Tivoli (a Sydney Dance Company and The Australian Ballet co-production); VAST (The Australian Bicentennial Authority); Hua Mulan (a Sydney Dance Company and Shanghai Song and Dance Ensemble co-production); Die Silberne Rose (Bayerisches Staatsballett, Munich); Water (Shanghai Ballet); Forty Miles–A River of Dreams (Tasdance); The Frock (MADE); Embodied (Mikhail Baryshnikov); and The Torvill and Dean World Tour Company. He also choreographed Death in Venice (Canadian Opera Company); Samson et Dalila (The Metropolitan Opera, New York); the movie Mao’s Last Dancer and the Andrew Lloyd Webber musical Love Never Dies (currently showing in the USA).